This is the story about Agnes. Agnes is what we in Danish call a duftranke. 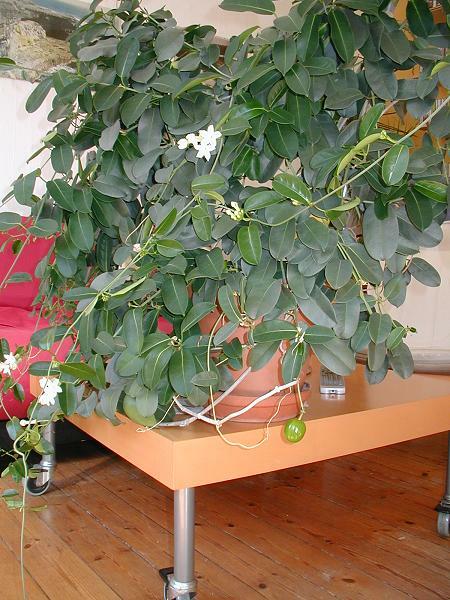 In English she's a Madagascan Jasmine and her Latin name is Stephanotis floribunda. Agnes came into my life many years ago when she and her mum, Irish Antoinette, were living here in Copenhagen. Anto left here in 1990 and left Agnes with me. 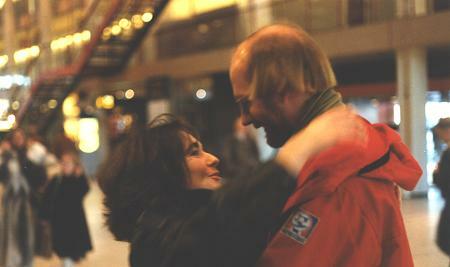 Copenhagen Airport. Anto is leaving for good. Agnes was only a wee lass when she moved in and I didn't really know how to take proper care of her. In fact, she moved in with a whole load of brothers and sisters who all died within a year, but Agnes is a survivor. I have since read that she should be kept out of direct sunlight, but she has been in my window sill for sixteen years now and she seems quite happy there. In fact she often delights me with her beautiful scent which mainly is there during evening time. I have done my best to look after her and whenever I haven't been able to cope with her Stine, my downstairs neighbour, has been around to give her sisterly advice (and water). Agnes is still in my window sill and has grown out of many a pot and she is as happy and beautiful as ever. Last year she was a bit depressed and had very few flowers during the summer, but this summer she has been in full bloom and there's still a good bit of new flowers on her. Yesterday (September 16th 2005) I discovered Agnes was pregnant!!! I couldn't believe my own eyes when I saw her new fruit. I had no suspicion that she had been up to something, but I suppose it shouldn't come as a big surprise to me that a young wan like herself should have a sexual urge. I do remember swatting a huge wasp earlier in the year - there may be some connection there. Here she is proudly showing off her fruit. I had to move her in order to get a proper shot. 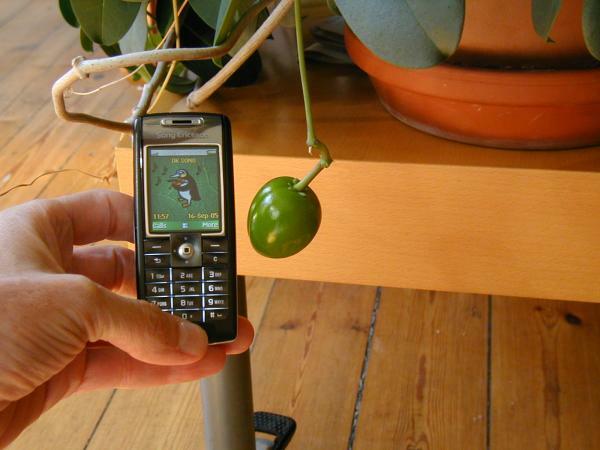 A close up with my mobile to give an idea of the size of her fruit. I have been Googling in order to find out what to do when things come to a head. 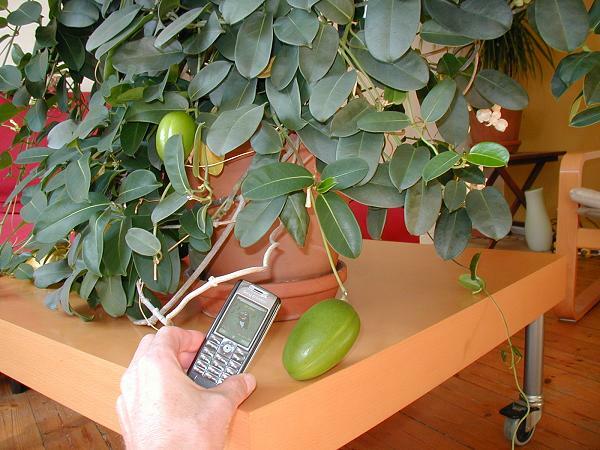 Stephanotis floribunda will occasionally produce longish, fleshy fruits particularly during warm summers. 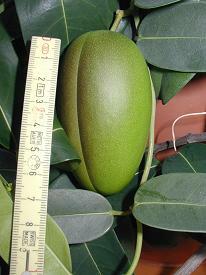 The fruit may reach 10cm (4in) or more in length and have been described as resembling a large pear, although they are not edible. The fruit take several months to ripen and if necessary, they can be picked and placed in a warm situation to encourage ripening. 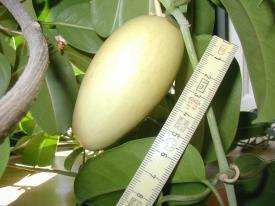 Once the fruits are fully ripe, they will begin to split and turn brown. 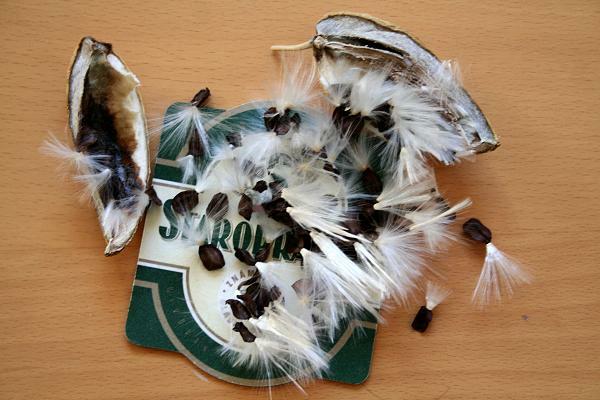 At this stage, the two halves can be pulled apart, to reveal a central mass of flattened seeds, which have a silky plume of white hairs, attached to one end. 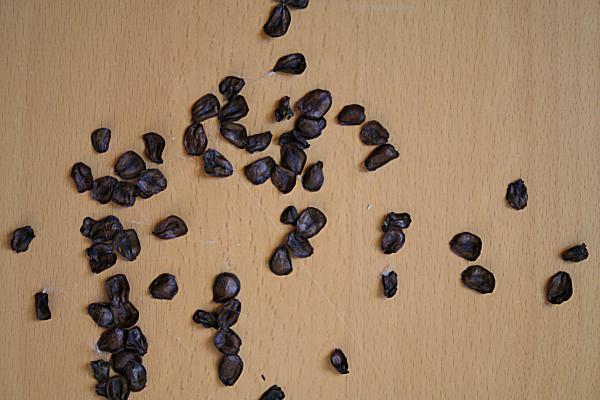 Store the seeds overwinter in cool, dry, frost-free conditions. Sow them thinly in spring, covering lightly with compost, in a temperature of about 20-24°c (68-75°F). 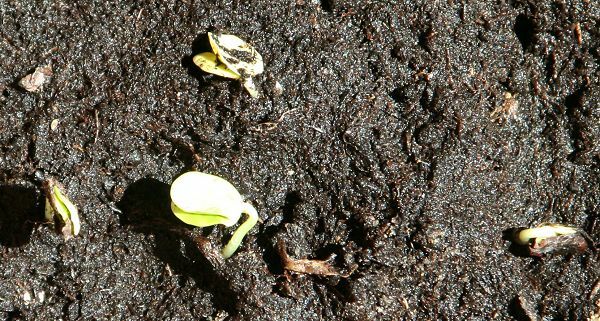 Sow plenty of seeds, if space permits, as seed viability may be low. Well, I don't know about that! The fruit looks more like an enormous olive to me. Knowing Agnes I doubt very much that her offspring will be of "low viability". Then again knowing myself it is a wonder that Agnes is still alive. I will keep on Googling and find out more about how to keep her children happy and I will update this page when there's something new about her condition. Today I wanted to take a picture of Agnes's condition to show how much her baby has grown. When I took her down from the window sill I discovered that she is expecting twins!!! Her new baby is about the size the other one was when I discovered it first. Obviously there's no end to the surprises she has for us, so keep logging into this page for more updates. Well well - we are up to triplets now. A third one emerged among the leaves. 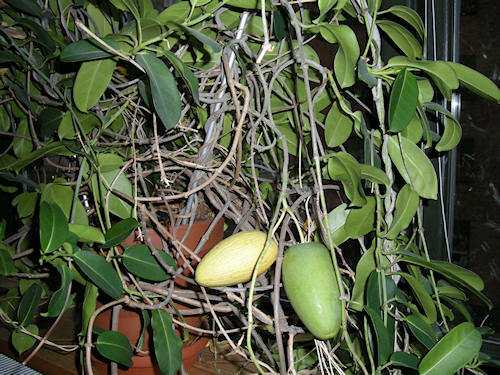 The other two fruits are still green and attached to her. Status: Seeds from fruit number three are all dried and two weeks ago I sowed about ten of them. Fruit no. one I clipped off Agnes four months ago, hoping it would dry up like fruit no. three did while still attached to Agnes. Only now is it beginning to dry up. 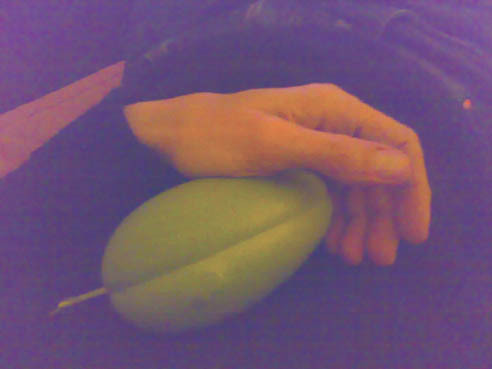 Fruit no two is still clinging on to Agnes. Anto was in Copenhagen and I gave her some of the seeds. Let's hope they will grow in London. 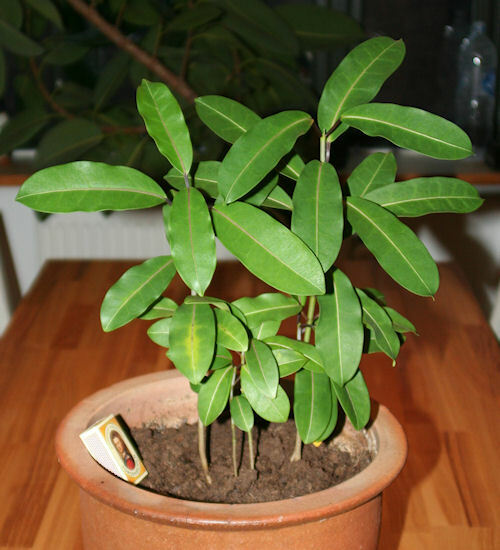 I have come across my first plant two years ago and planted it in a pot at the main entrance to the house. It didn't do extremely well the following year but last year we had lots and lots of flowers and to our big surprise, one day we noticed a huge fruit hanging down from a top branch. The next day we found another one. It was amazing. Sure enough we googled for more information and found very little. At the meantime the fruits kept growing but after a few months when I saw nothing happened and fearing I may lose them, I removed one fruit and kept in a the shade. After a few weeks I noticed the fruit was kind of shrinking and losing its vibrant green color and turning yellowish at some spots. Fearing it was rotting I slit it across one side and split open, and to my amazement it showed beautiful seeds all attached to a centre "pole". I removed one seed and planted it. Then I bumped into your web site (which I couldn't find before -- sometimes putting the right words in makes the difference!) and got so much information! Thank you. 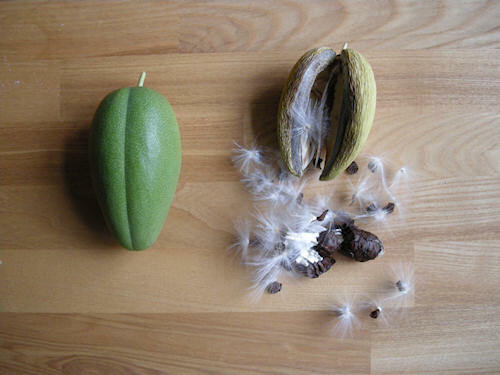 Also, the one fruit on the tree should it be left on the tree or removed and stored? 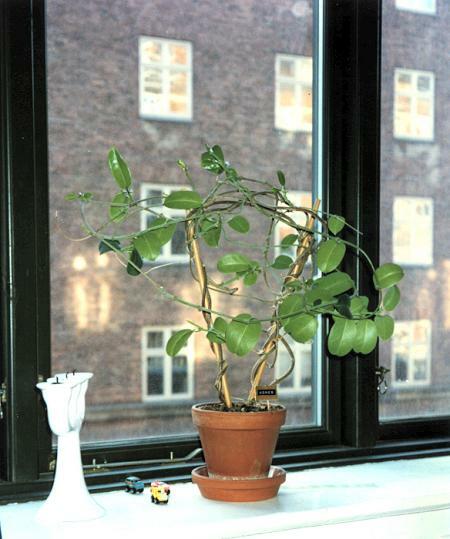 my name is Sabina, I live with a Stephanotis from 23 years more or less, we changed many haouses and towns, so you could well immagin how I feel close to this my old friend! I did'nt not give her a name, I don't know why, usually I give names, but not in this case. 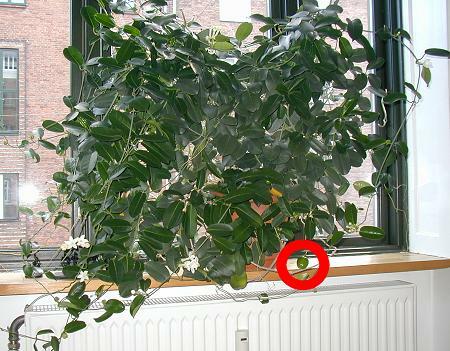 Well, my stephanotis this year give me a fruit, one only, but very very powerfull. Infact this fruit run to the risk to make the mother die, that's why I decided to cut him from her because I though he want eat too much! 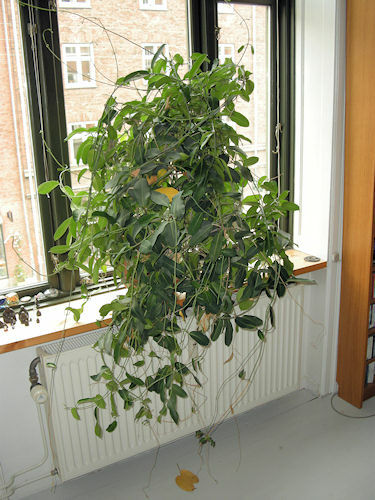 Now, since 3 or 4 weeks the fuit is calmly sleeping in the most dry part of my house, to avoid mould..you know. But I don't see any change in his face, I mean is still green. Could you tell me if you have cut too the fruit from the mother? 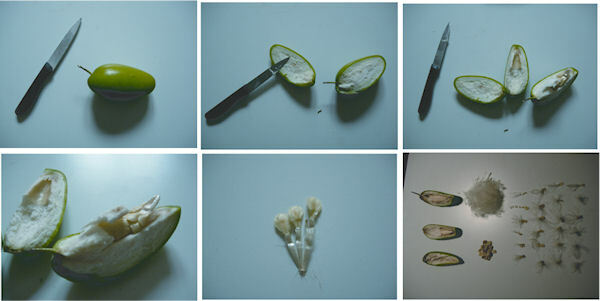 And how long you wait before have the totally dryness of the fruit and see the seed? Isn't this great? More fame :-) Again I gave my best advice. 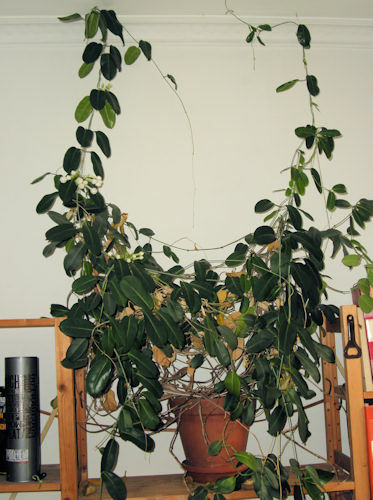 your kind answer is been very very important to me, because in this part of the world (Italy and maybe also the all Europe) nobody knows about our Stephanotis problems.. there is like a big kind of ignorance about it, isn'it? 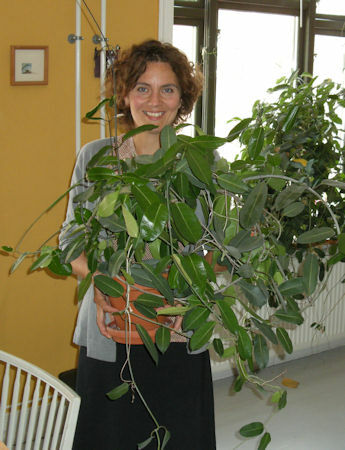 So i think is great thing that we can have a botanist exchange by web! I sure follow your councils, and let you know in the next month how the situation will develop. 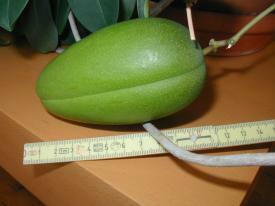 This is picture of the fruit after the give birth. 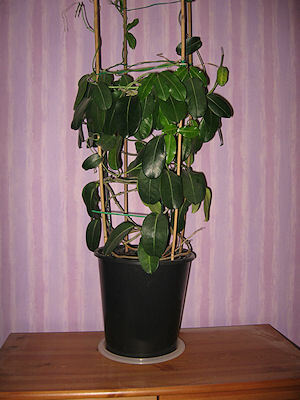 I am a keen gardener and have over 50 indoor plants including serveral thriving and beautiful orchids, so I borght a stephanotis, I repotted it, (using John Innes houseplant compost) and added canes for extra support. Thinking it would make a nice addition to my collection and not be too difficult to grow. It hasn't done very much at all in the almost full year that I have had it, it starts to grow then the tiny new shoots die off. So it has just sat there not changing very much at all let alone flowering. This month though has got worse, the leaves are going yellow and dropping off, and despite doing what I believe is correct and checking all the books and websites I am at my wits end. As you can see it is in a reasonable sized pot which has good drainage at the bottom, and the tray beneath has pebbles for humidity. I spray regularly, and had given food throughout the summer, I have decreased its watering for the winter and the soil is neither too dry or too wet. Its in my bedroom adjacent to a South facing window, the temp has been monitored and stays between 18 and 22 degrees c (not sure what that is in f). Do you think it could be a virus? and have you any ideas that maght help - including talking a cutting at this time of year - just in case. I also thought about repotting it to see if that would help, but I dont like to repot in the winter as a general rule. sorry this e-mail is so long, I hope you can help. I opened my fruit and I stop some magic moment with the camera, the kind of silk inside is so soft and pretty!!! Well thanks again for you help! I came acoss your pictures and story about your Agnes. I am fascinated by it and envy how well she has adjusted with you and your home. I am in Toronto and yes, Agnes has become famous here too. I need help, maybe , Agnes can advise me how to take care of her cousins here in Toronto. My problem is the same as Jenny from Cornwall. 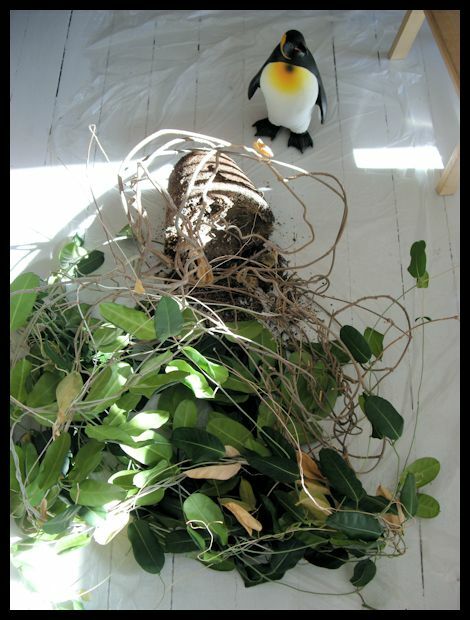 Every year , I buy an expesive Stephanotis and in a few months they leave me. This one too I bought in September. It is siting in my South west window about 2 feet away from the window. FOr the first few months it did well nut now I am loosing leaves as they turn yellow and die , about 2 every week and also have lost the tender new growth. What am I doing wrong.How is it that you manage to grwo the same plant for so many years? I love this plant and any help you can give me to save it and make it healthy again will be greatly appreciated. Thanks you very much and my best wishes to Agnes and hope she has a happy life for a long long time. 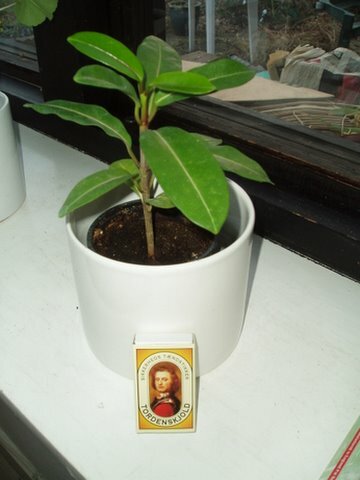 My very good colleague, Agnete, sent me a picture of one of Agnes' babies she has been growing. 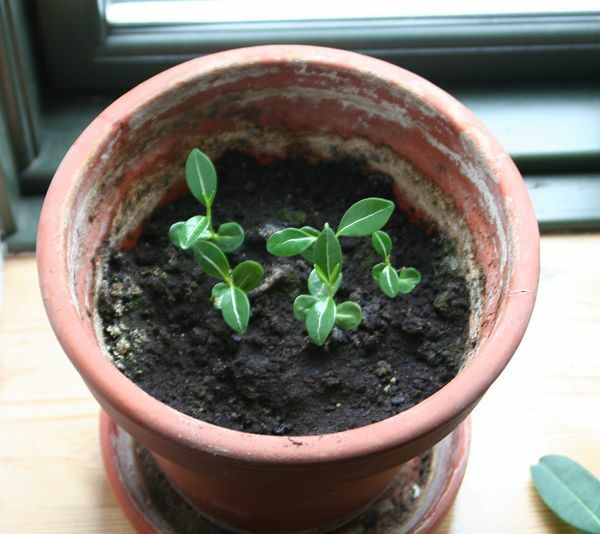 Agnete got some of the first seeds from Agnes and now things are happening there too. Look at the stem of that plant! She actually sent me that picture about a month ago, but I have been busy with all other things and have not had the time to upload till now. You and your lovely Agnes have certainly become famous world-wide! 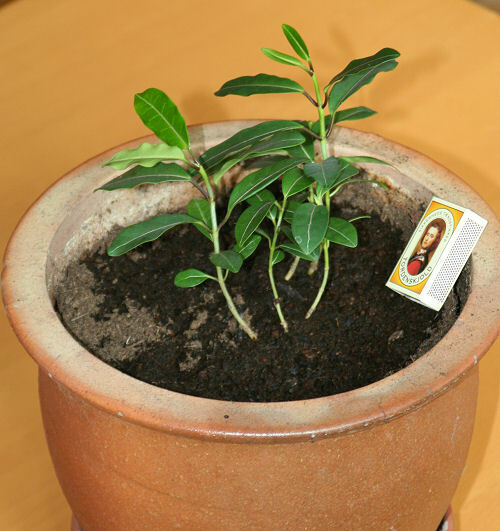 I am writing to you from New York, and have just brought home a 5 inch pot with an Agnes of my own, although I believe my little one's name is Stephie. She is my mother's day gift to myself. I may be finished having babies, but perhaps someday my Stephie will surprise me with some! I used to have one many years ago which seemed to thrive quite well on benign neglect. Although I am tempted to repot this one into a larger pot, something tells me that they like to be a bit root-bound and cozy. I will wait and see. I used to keep it on a screened in porch in the summer, and in a fairly chilly window during the other three seasons and it bloomed beautifully throughout the years. I'll keep you posted. Thank you for keeping such a great diary and thank you for the amazing photos of the fruit! She has done it again! 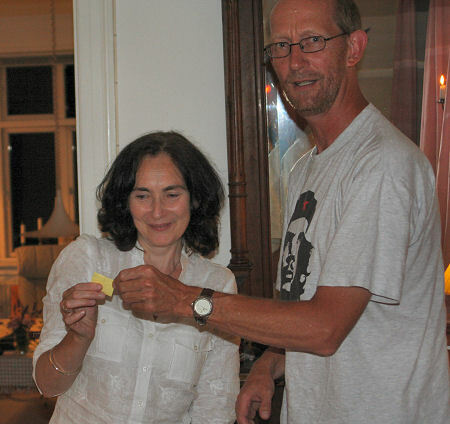 About three weeks I had a few guests here for dinner and cards and during a break in the game my good friend Bríd (who also has one of Agnes' babies) loudly exclaimed that Agnes had a fruit. On closer expection it turned out she had two. I had no idea. It has been a while, but Agnes and family are still well. Agnes is getting older and doesn't bloom as much as she used to. She has moved places and is happy with that and she is also very happy with her new summer-minder Sophie. The little one (who is not so little anymore) was adopted by mu good colleague, Dynke, a couple of days ago. Here's Dynke when she came for the little one. It has been a while since this oage was updated, but things have happende. Daphne is dead! 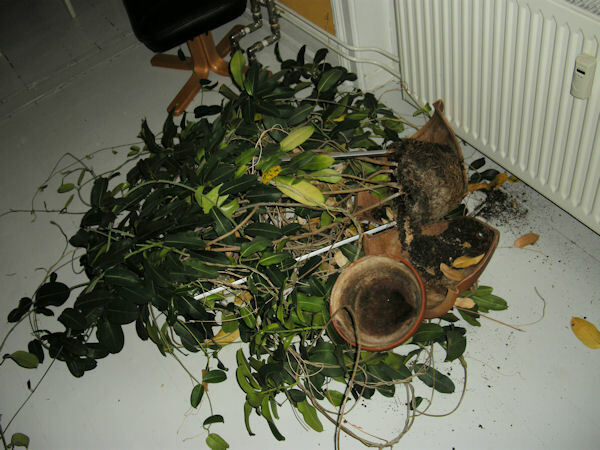 A couple of months after Dynke collected the "Little One", I was sitting on my couch when I was startled by a big bang and a crashing sound. Daphne had thrown herself off my window sill (and made a big dent in my nice floor at the same time). My theory is that she was missing her sibling and decided to put an end to it. She was duly put to rest in the garbage. The "Little One" has moved to Fyn and is loving it ehere according to Dynke. Euthanasia was performed on Agnes today. Her life wasn't worth living anymore. She hadn't bloomed for a couple of years and was put to rest before total decay took over. One old friend turned up for her last travel to the green bin. Agnes R.I.P.